Things have been quiet on the SSDI front for a couple of weeks, but they heat up again today. There’s a hearing being held by the Senate Finance Committee’s Subcommittee on Fiscal Responsibility & Economic Growth starting at 10 a.m. EDT today1 on yet another bill to restrict access to the Social Security Death Master File — known to us genealogists as the Social Security Death Index (“SSDI”). Nelson’s bill really focuses on identity theft and fraudulent tax filings by people who steal the Social Security numbers of others and would only delay disclosure of death information reported to the SSDI.4 Johnson’s bill would take the SSDI away from the public forever.5 If we have no choice but an either-or, this one is a no-brainer. Here’s how Nelson’s bill would work. Under § 9(a) of the bill, SSDI information wouldn’t be available to the public for any person in the year of that person’s death or in the calendar year after the death. So if a death occurred on 1 January 2012, that SSDI entry would only become public on 1 January 2014, a total delay of one year and 364 days (well, okay, 365 days, since 2012 is leap year). For a death on 31 December 2012, the information would be still become available on 1 January 2014. So we’re talking about a delay of one to two years. And there’s at least hope that this version of the legislation could be tweaked to keep that door open for those who really do need it. There’s a provision in § 9(b) of the bill for a certification program so that some people with “a legitimate fraud prevention interest in accessing the information” could get access to it earlier. Obviously, that’s for banks, credit agencies and others who need to verify identity to prevent other kinds of financial fraud. There’s no good reason why our forensic genealogists couldn’t be included in that certification program. Anybody who’s working under government contract — federal, state or local — should certainly be eligible for this program. Those who work under the supervision of a licensed attorney — whose own license could be at risk if the information is misused — should also be eligible. This adding-forensic-genealogists-to-the-certification notion may all be a pipe dream depending on how this hearing goes today, and how later hearings go on the House side. We’re still the Number One punching bag for those who want somebody to blame for identity theft (“it’s the damn genealogists!”) and an easy answer (“close the SSDI!”). But if we stay vigilant and stay on top of this issue, all is not (yet) lost on the SSDI front. 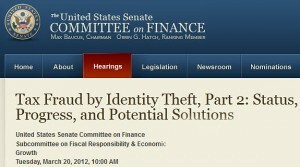 Check out a story on http://www.cnn.com today about tax fraud. The thieves are stealing identities using illegally obtained SSN of living people and then filing tax returns to gain income. This is a much bigger deal than the SSDI stolen identities, but Congress and others are ignoring the situation. Thousands of people are being bilked out of their tax refund, to say nothing of the governments losses (and us taxpayers). Washington is even ignoring the police who are dealing with the situation. Can’t believe it! Read the article and get mad like I am. Some of the bills don’t ignore the issue; they just try to fix it in silly ways, like closing off the SSDI. The delay or removal of the SSDI will have a significant affect on my family history research. I have two family histories where I am identifying the descendants for the past 200+ years down to the current generation. The SSDI helps me keep track of those who have recently passed away. The only option is to Google for online obituaries. The pendulum always swings from one extreme to the other in our free wheeling society. The pendulum certainly does swing — we can only hope that we can keep it somewhere towards the middle at least some of the time!